The bins compact the litter so they can hold more. DUBLIN CITY COUNCIL (DCC) is looking to procure 800 solar-powered compacting litter bins to reduce the number of bins around the city. DCC has submitted a tender seeking expressions of interest in providing the service saying it could reduce the number of litter bins around the city by 20%. 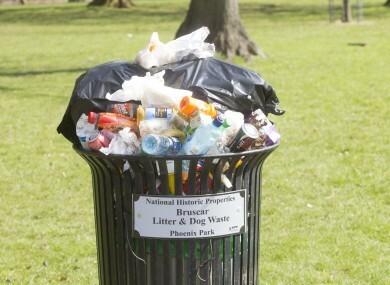 At present, there are about 1,150 litter bins across the capital and DCC wants to reduce this to about 800. It’s envisaged that, as far as is possible, the new smart bins would be placed in the same locations as the current bins. If this wasn’t possible they should be placed as close as possible to the current locations. Solar powered compacting bins work by storing energy from the sun and using it to power a rubbish compactor inside. This allows the bins to hold up to eight times as much rubbish. The bins also monitor how much rubbish is inside and can notify collectors when they need to be emptied. DCC’s tender advertisement makes clear that the council is seeking a public waste system that compacts the litter and can be monitored by way of a web portal. Email “Dublin could be getting 800 new solar-powered smart rubbish bins”. Feedback on “Dublin could be getting 800 new solar-powered smart rubbish bins”.